The current evening apparition of Venus has been truly memorable and after cosying up to Jupiter and the Moon in recent weeks the queen of the planets entices the splendid Pleiades open star cluster (M45) into her clutches. Astronomy Now graphic by Greg Smye-Rumsby. As the skies start to darken sufficiently tonight (2 April) around 8pm BST Venus lies under a degree (two full Moon widths) south west of the Pleiades and the view in binoculars and small telescopes will be spectacular! But it only gets better as on the early evening of 3 April Venus enters the eastern part of the cluster, although none of the seven Pleiads or 'Seven Sisters' are occulted. 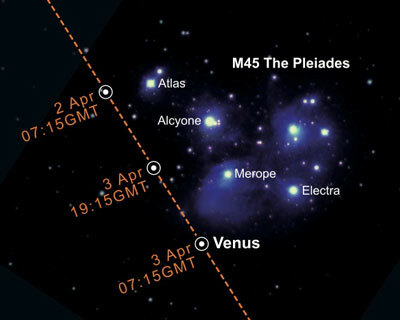 At 8pm Venus lies just under half a degree south of Alcyone (eta   Tauri, mag. +2.8), the brightest star in the Pleiades. By the following evening (4 April) Venus lies just over half a degree west of Atlas (27 Tauri, mag.+3.6). If you are blessed with clear skies, do make the most of this opportunity as, according to my colleague Peter Grego, it will be another eight years before Venus is this close again to M45. If you have a telescope it's a great chance to observe Venus itself, as it is splendidly placed in the western sky, about 36 degrees up at 8pm and not setting until four and a half hours after the Sun. But, whatever you do, ensure that the Sun has set before attempting any observations. Venus is a blazing magnitude -4.4 and shows just under a half phase spanning around 25 arcseconds. As the month progresses the crescent phase narrows as its apparent diameter increases. It also brightens slightly, reaching it's brightest on 30 April.